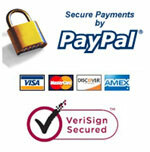 Our site accepts all major credit cards, as well as eChecks and bank transfers. Processing is done by Paypal. You do not need to sign up for a Paypal account to place payment. If you don't have an account, your credit card will be processed just like it is through other processors. PayPal is the faster, safer way to pay and get paid online. The service allows members to send money without sharing financial information, with the flexibility to pay using their account balances, bank accounts, credit cards or promotional financing. With more than 78 million active accounts in 190 markets and 19 currencies around the world, PayPal enables global ecommerce. PayPal is an eBay company and is made up of three leading online payment services: the PayPal global payments platform, the Payflow Gateway and Bill Me Later.